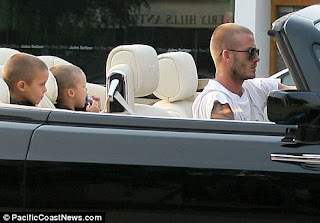 David Beckham and his two youngest sons turned heads as they rolled down Rodeo Drive in the football star’s $600,000 Phantom Drophead Coupe. While I know that Cruz, 3 and Romeo, 5 are having fun in daddy’s flashy car, I can’t help but wonder why the youngest Beckham isn’t in a car seat. Cruz, who just turned 3 in February, is still too young to be in a booster seat, especially when many car seats now go up to 80lbs for maximum safety.